According to the United States Senate Committee on Agriculture, Nutrition, & Forestry, Congress passes legislations every five years, called the “Farm Bill”, that sets the national agriculture, nutrition, conservation, and forestry policy. The negotiations over the 2018 Farm Bill cover commodity support and risk management programs, which are the second largest USDA budgetary expenditure after nutrition programs. Congressional budget disciplines, declining net farm income and prices for several major crops all play into the negotiations over program changes. In the Track session “Risk Management Programs and the Farm Bill”, provided by the Applied Risk Analysis section of the Agricultural & Applied Economics Association (AAEA), economists from USDA FSA, RMA, the Chief Economist office, the crop insurance industry, and academia will give their perspective on issues regarding changes to risk management programs in the Farm Bill and their implementation. 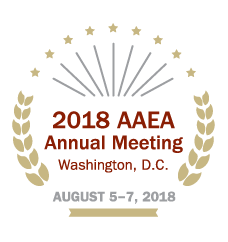 Over 1,600 participants are expected to attend the 2018 AAEA Annual Meeting, which will take place on August 5- August 7 at the Marriott Wardman Park in Washington, D.C. This session will be on Monday, August 6, from 2:45 – 4:15 pm. If you are interested in attending the 2018 AAEA Annual Meeting in Washington, D.C., fill out the “Press and Media Registration” PDF form on the Press and Media page or contact Allison Scheetz in the AAEA Business Office. You can also learn more on our Annual Meeting Media Kit page.